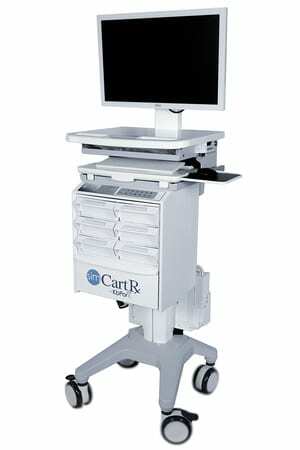 Medical equipment carts are essential to today’s fast-paced medical settings. Just as doctors and nurses need to stay updated on the latest medical developments, hospitals and doctors’ offices need to adapt to ever-changing technology standards. Whether you are in a hospital emergency room, clinic, or doctor’s office setting, medical carts can make the lives of your medical staff easier. Medical equipment carts are versatile, not only because they hold a variety of medical equipment but also because they can be used in a multitude of settings. Medical staff can use these carts to hold a patient’s personal possessions, carry syringes and needles, or make the transport of a computer or medical records easier and more efficient. The medical arts look to technology now more than ever before to manage medical workflow. Hospitals and doctors’ offices store all their records and communications with patients electronically, and medical staff often need to look something up in an instant. 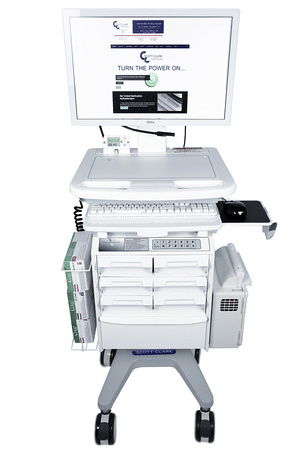 The ease with which a computer can be transported from room to room or floor to floor improves with a medical equipment cart. A medical cart provides a firm surface for writing notes and prescriptions or handling various bins or trays of medical equipment. Additionally, medical staff can often pull up records with the push of a button on the built-in computer or tablet rather than having to visit a nurses’ station or records office for documents and files. The advantage of working with Scott-Clark Medical is that we can make medical carts suitable for your unique needs. We listen to the needs and concerns of your medical facility to design the best and most efficient cart for your workflow.